Touching first novel, containing occasional gruesome violence, about a race of genetically modified, technologically advanced, extraterrestrial canines whose survival requires they domesticate a primate species. For reasons unknown, the highly intelligent Lindauzi are seeing their genetic enhancements fade. Many, fearing the hopeless savagery of their canine past, commit suicide. Prince Corviax believes that an empathic relationship with another species might stop the reversion. On Earth, they unleash a plague that wipes out all but a few “wild” humans, and occupy the northern cities (they like the cold). A few captured human beings become subjects of a multigenerational enhancement program. The remaining ones are exterminated by the Lindauzi's horrifying servant race of lizard hunters. 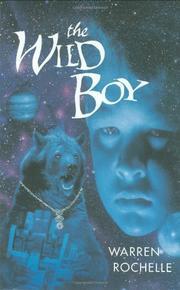 The Wild Boy begins 150 years after the Lindauzi conquest, with wild boy Caleb. His village destroyed in a Lindauzi raid that kills his brother, Caleb begins a quest to find their father, Ilox. After escaping Lindauzi kennels, Ilox had mated with Caleb's mother and then vanished mysteriously. Rochelle contrasts Caleb's quest with ironic flashbacks of Ilox's awkward, but ultimately loving, bond with a Lindauzi prince, Phlarx, who eventually commands the breeding program. In switching the roles between pets and masters, Rochelle makes an effective, albeit frequently heavy-handed, statement about the joy and sorrow man shares with animals, and his responsibility to them.